So you like to entertain? More and more households are moving their living rooms outside, so why not make sure you do it the right way. Outdoor entertaining is part of the Australian lifestyle, so here is our guide to designing the ultimate alfresco. Before you get started, think about how you plan to use your outdoor area. You’ll want to enhance your connection with the outside as much as possible – with space, light, breezes and views. Consider where you want it to flow from the rest of the house. Separate your zones for cooking, dining, relaxing and free form spaces. There are a range of different flooring options to choose from; to suggest a few popular choices there is timber, pavers and concrete. If you’re choosing timber, you’ll need to ensure you keep up a finish on it – it’s unavoidable. Other options to get the decking look are Modwood and Rubicab decking; they use a recycled sawdust and polymer that require no finishing at all. If you plan on using pavers, consider a pattern that suits both the style of paver and your home and ensure it meets slip-resistant requirements that also won’t get too hot in the sun. Exposed aggregate concrete is always a popular choice as well. Add atmosphere to those balmy summer nights through the use of different garden lighting. Solar lights are a perfect option for garden beds and grassed areas. For lighting up steps consider installing deck lights. If you want to make the most of your outdoor area all year round then consider bi-fold doors to bring your outside space inside. Close it off on rainy days and open it up when the sun is shining. 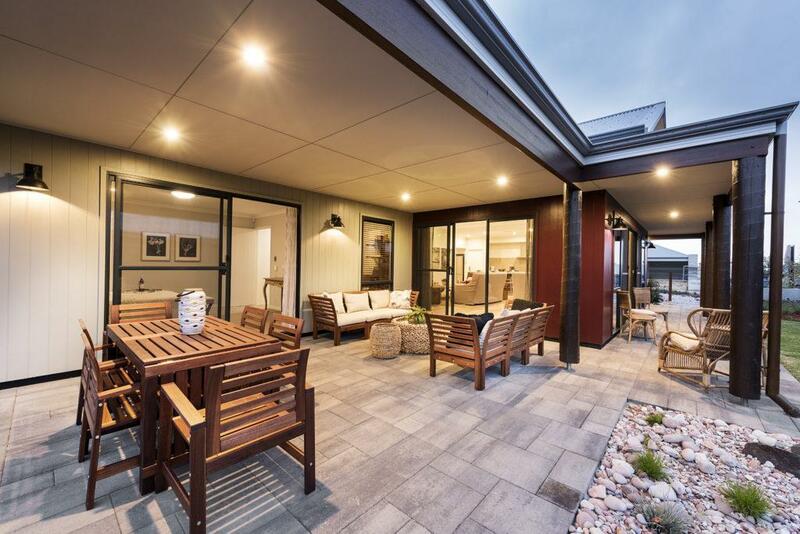 Creating outdoor spaces that can be used year-round is really important to enhance the experience of your home, and improving its liveability. Other ways to get winter use is to include a heat source such as a fireplace or a pizza oven. There are also some great external heaters available. To cool the space in summer months make sure the layout of your alfresco can capture the breezes or opt for a ceiling fan. 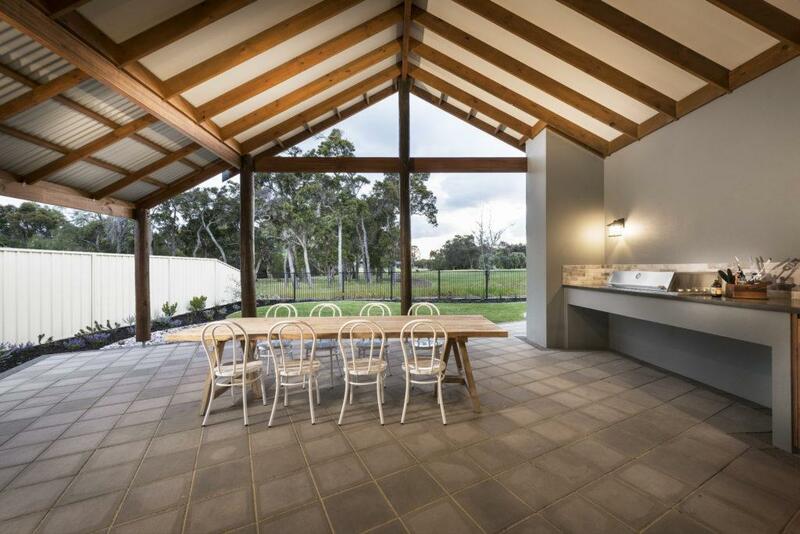 No outdoor entertaining area is complete without a kitchen to go in it. If you have a great outdoor space, you’ll want to be eating in it. Save yourself heading in and out the home by preparing food outside with your guests. Special additions such as bar fridges, sinks and kitchen facilities will make hosting easy and fun. As you know, in Western Australia it can get really hot in summer. Being comfortable outdoors is reliant on getting some cover to reduce the glare and heat. Shade can be created in a permanent or flexible way, and depending on your need for weather protection it can be part of your roofing. 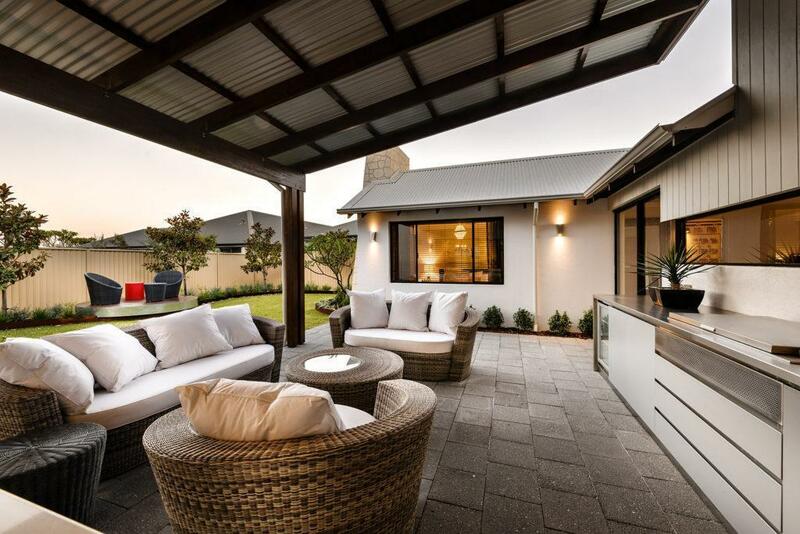 Consider an alfresco made from timber or aluminium, or perhaps use shade cloth in some areas. Including a feature for people to look at in the garden adds interest to your outdoor entertaining area. Whether it’s an outdoor setting, verticle garden or fire pit, having something with that ‘wow’ factor is great for drawing guests to the outside. Some people opt for a water feature as they create a relaxing atmosphere by providing white noise. It’s always great to have a range of alternative seating options in your outdoor area. Options could include chairs around a table, bench seats, lounges and bar stools. Having different options will create a great adaptable space to entertain in. You’ll have hangout options to suit the mood and ambience of different social gatherings.